Durable dispenser with rotary crank for dispensing paper towels. Holds 8 in or 9 in wide roll towels. Rotary crank to dispense exact amount of paper. Key-lock design to prevent waste and pilferage. Refilling is quick and easy. 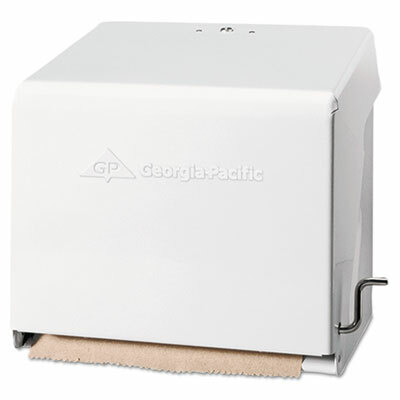 Durable Mark II dispenser holds one 8 inch or one 9 inch wide roll towel to offer a cost-effective solution for towel dispensing. Rotary crank allows people to dispense exact amount of paper needed for drying hands. Versatile white metal complements any decor and the covered key-lock design to prevent waste and pilferage, making refilling quick and easy. Durable steel construction. Click here to see more Towel Dispensers!